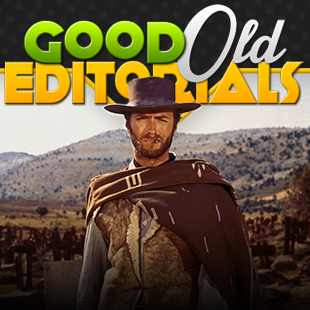 Why Aren't There More Westerns? When I sat down to play Outlaws, one of my first thoughts I had was how I would follow it up. Initially, I thought it might be a good time to put together a new top ten list. The problem was the fact that, in addition to not having played ten westerns, I hadn't even heard of that many. 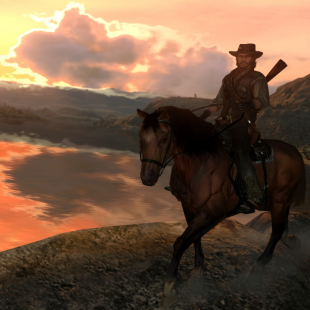 A quick Google search revealed that the gaming industry has, in fact, produced more than a few games filled with big hats, six shooters, and grim-faced loners riding off into desert sunsets. The thing is, even if western-themed games exist, few are notable and, in total, they're far outnumbered by the glut of titles based on other "popular" periods of history. The Wikipedia list of games based in or around themes from the Old West number less than a hundred. World War 2 games, comparatively, easily surpass 300, a number that's only likely to grow larger despite the pendulum of popularity having long since swung away from the genre. To be fair, the Old West isn't the only historical period or subgenre that has been overlooked by the gaming industry. Casually browsing the history section of your local library would be all you'd need to find underutilized settings, both obscure and well known, for fun and interesting video games. The thing about Westerns though, at least in my opinion, is that they just seem so obvious. Even people who have never sat through a western movie can probably close their eyes and picture what they entail. Bandits, cowboys, six shooters, desert towns, sleazy taverns, horses, steam trains, high noon showdowns; the genre possesses a catalog of iconography that's so ingrained into pop culture that it's practically unavoidable. And yet, somehow, games have done a damn good job of avoiding it; something I can't say I really understand. At first I thought it might be that the genre has too much historical ugliness attached to it for it to be regularly palatable to game developers. As I thought about that more deeply, however, I realized that it didn't make sense. You'd be hard-pressed to find an era of history lacking mud, blood, and nasty moments from all sides. The Nazis might have been the uncontested baddies of WW2, but the Allies still had their awful moments. The frequent moral ambiguity of today's wars have, likewise, done nothing to dissuade every publisher and its proverbial uncle from producing a modern warfare game. No, what I think it boils down to is a simple matter of business. When certain kinds of games do well, publishers and game developers produce a lot of them. Since the dawn of gaming time, people have looked at successes and tried (and tried and tried) to emulate them. It doesn't matter if you're talking space marines, WW2, flight simulators, World of Warcraft, Minecraft or modern warfare games. Everyone's chasing the same goal (a.k.a. money), they're just changing their shoes every five to ten years. That in mind, Western-themed games might be less prominent simply because they haven't had a huge enough hit for the gaming industry to bother cloning. Try to bring to mind all of the Old West games you can think of people widely remembering. There's Custer's Revenge, but I don't think we want anyone copying that. Outlaws has its following, but it still never made a huge splash. The Call of Juarez games had a few solid entries, but the series fizzled out after its third entry tried to jump on the modern parade. The only real contender I can think of is Red Dead Redemption, a game that sold well, but was bound to scare off most potential imitators through the simple virtue of being massive. The sad thing is, prohibitively gigantic as it was, Red Dead Redemption also perhaps provided the best example of why big developers should be embracing the Western genre. To be sure, it had some problems and a few uncomfortable moments that RockStar, in retrospect, maybe should have left on the cutting room floor. That said, even though it was basically just Grand Theft Auto with horses, it used the setting of the American frontier to fashion a story that actually managed to have some genuine meaning to it. The quiet austerity of wandering the wilderness, the inevitable corruption that accompanies expansion, the inescapable nature of a man's sins; the tragic story of John Marston was one uniquely born from its specific genre. I honestly don't think it would have felt the same if it had been set in a more generic setting. Simply put, it, much like Outlaws, used its setting to overcome its similarities to other games and feel different. I don't know about you, but I never sit around thinking to myself that what I need is a whole lot more of the same. Don't get me wrong, there are plenty of games I like that don't stray far from the beaten path. As long as they were good, I could probably play a thousand games set in medieval Europe. However, I wouldn't mind a few other big budget games, where I could find myself trotting alone through a desert with the only sounds being the quiet strum of a guitar, the clap of my horses hooves, and the rising roar of a storm surging in the distance. Next week I review the space sim classic Freespace! In the mean time feel free to PM requests and suggestions!